Traditional retailers face a challenging business environment, marked by continuing margin pressure, encroaching efforts of digital-native rivals and greater global competition. At the same time, they must contend with issues such as limited supply chain visibility, empowered consumers, high transac-tion fees and the need to battle counterfeit products. Blockchain has the potential to address these and other issues faced by retailers today. First used in 2009 for the digital crypto-currency Bitcoin, blockchain technology has extended far beyond the financial services industry and impacted nearly every major industry, including retail. Blockchain pro-vides a way to conduct and record transactions through a peer-to-peer network that replaces the traditional role of a central trusted authority. Blockchain networks create proof of ownership by using unique digital signatures that rely on both public encryption keys known to everyone on the network and private keys known only to the owner. Complex algorithms drive consensus among users, ensuring that transaction data cannot be tampered with after they are verified, reducing the risk of fraud. ”Smart contracts” can be created that execute automatically once their terms are met, without the need for human intervention. Blockchain platforms can be public (i.e., permissionless), like Bitcoin, with anyone allowed to submit a transaction and take part in validating other transactions. Or they can be private (i.e., permissioned), where only authorized participants can share and validate information.3 Private blockchains pivot around reputational investment of the actors that participate in the network. This allows for innovations that address the speed, privacy and scalability concerns of public blockchains while reinforcing the validity of transactions. For retailers, blockchain holds the promise of delivering trust in a product, transaction or the integrity of data more effectively and at lower cost than ever before. Blockchain applications could help retailers improve supply chain visibility, ensure product provenance and authenticity, speed up transactions, reduce processing fees, and improve the management of networked loyalty programs. Given blockchain’s potential benefits, it is not surprising that 87% of respondents said the technology will be important to the future of their industry, including 46% who said it will be very important (i.e., it will fundamentally transform the industry). Similarly, 80% of respondents said they believe that blockchain will be important or very important for retailers to stay competitive in the years ahead. A number of leading retailers are actively gaining expertise and exploring the potential of blockchain-enabled solutions. For example, in May 2017, Walmart applied for a patent for a system that would use blockchain technology to track packages delivered by drones.4 Target is reportedly hiring blockchain experts to build its capabilities. The most frequently cited reasons for pursuing blockchain pivot around gaining competitive advantage (70%) and harnessing its perceived benefits (68%). In contrast, relatively few respondents said their organization is pursuing blockchain for defensive reasons, such as keeping up with the competition (36%) or warding off business disruption (14%). Blockchain is expected to have a wide impact across retail organizations, with a high level of impact anticipated in finance (44%), IT (44%), operations (44%) and data management (39%) functions (see Figure 1). This is consistent with the notion that respondents often said they expect that blockchain will yield benefits in improved data management (52%), process automation (43%) and cost efficiencies (40%). As retailers struggle to do more with less in a margin-squeezed environment, the potential for blockchain to reduce operating costs is one of its principal attractions. Blockchain adoption will result in cost savings of more than 2.5% according to 82% of respondents, while 36% said they believe the savings will be greater than 5%. Much of the cost savings could result from automation, with 76% of respondents predicting that blockchain will allow their organization to automate more than 2.5% of its jobs. Indicate the impact of blockchain on the following functional areas. 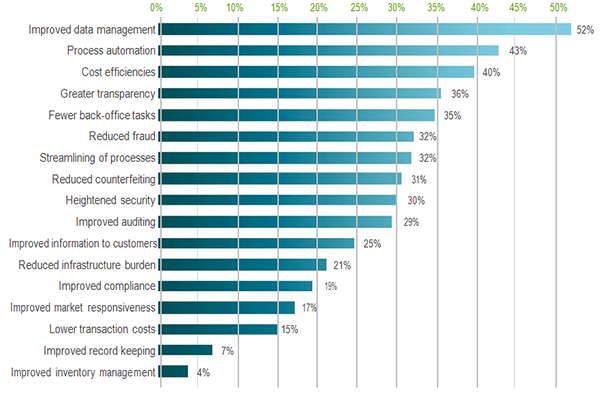 Other important benefits of blockchain cited by respondents are reduced fraud (32%) and reduced counterfeiting (31%). Blockchain could be used to provide consumers with the assurance that products are authentic, and 73% of respondents said that a tamper-proof, digital transaction history would provide a high or very high degree of value to their customers. For example, one sneaker manufacturer is using blockchain and 3-D-printed smart tags to prove product authenticity.6 Provenance, a start-up, is using blockchain to record each step that a product takes in the global supply chain and allow consumers to access the information by scanning a QR code. As retailers struggle to do more with less in a margin-squeezed environment, the potential for blockchain to reduce operating costs is one of its principal attractions. Reference: The article contents are originally written at and sourced from https://www.cognizant.com/whitepapers/retail-opening-the-doors-to-blockchain-codex2879.pdf. We don’t express/any claim to the ownership. If you have any concerns, please contact our editorial team.